If the source is a chemical battery, energy comes from the chemical reactions occurring in the battery's electrolyte, becomes transfered to electrical form, and then converted to heat and light in the bulb, all at the rate of 264 Joules per second (J/s). This question seeks to challenge students' perceptions of what constitutes electrical power. From the physical effects described, it is evident that there is more to calculating power than simply multiplying a voltage drop by a current! Solving this problem requires unit conversions: from "watts" to "horsepower." Let your students research how to perform this conversion, then discuss their various techniques during discussion time. 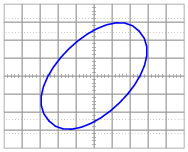 P = 0 horsepower, so long as the inductor is "pure" (100 percent inductance, with no resistance). What surprises the student, though, is power. In calculating power for each component, the student arrives at 4 mW for the capacitor (4 volts times 1 milliamp) and 3 mW for the resistor (3 volts times 1 milliamp), but only 5 mW for the total circuit power (5 volts times 1 milliamp). In DC circuits, component power dissipations always added, no matter how strangely their voltages and currents might be related. The student honestly expected the total power to be 7 mW, but that doesn't make sense with 5 volts total voltage and 1 mA total current. What is wrong with this student's power triangle diagram? How may we make sense of the figures obtained by multiplying voltage by current for each component, and for the total circuit? 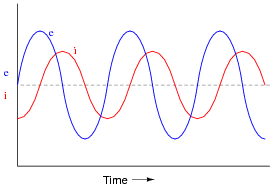 Follow-up question: when making the leap from DC circuit analysis to AC circuit analysis, we needed to expand on our understanding of öpposition" from just resistance (R) to include reactance (X) and (ultimately) impedance (Z). Comment on how this expansion of terms and quantities is similar when dealing with "power" in an AC circuit. 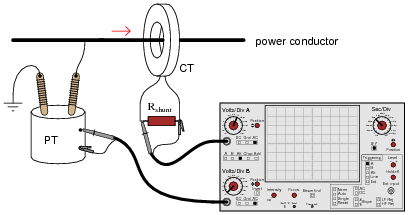 If someone were to read each of the ammeters' indications and multiply the respective currents by the figure of 120 volts, would the resulting power figures (P = I E) agree with the actual power dissipations? Explain why or why not, for each load. In every load except for the incandescent lamp, more current is drawn from the source than is "necessary" for the amount of power actually dissipated by the load. Ask your students how the ëxcess" current drawn by each load potentially influences the size of wire needed to carry power to that load. Suppose the impedance of each load were 100 times less, resulting in 100 times as much current for each load. Would the ëxtra" current be significant then? Being that most heavy AC loads happen to be strongly inductive in nature (large electric motors, electromagnets, and the "leakage" inductance intrinsic to large transformers), what does this mean for AC power systems in general? 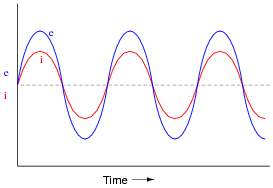 A very important parameter in AC power circuits is power factor. Explain what "power factor" is, and define its numerical range. Define true power, in contrast to "reactive" or "apparent" power. Define apparent power, in contrast to "true" or "reactive" power. Define reactive power, in contrast to "true" or "apparent" power. Explain the names of each of these power types. Why are they called äpparent," "true," and "reactive"? Äpparent" power is apparently the total circuit power when volts and amps are multiplied together. "Reactive" power is due to reactive components (L and C) only, and "True" power is the only type that actually accounts for energy leaving the circuit through a load component. Follow-up question #2: substitute p, f, and either L or C into the reactive power equations so that one may calculate Q without having to directly know the value of X. Ask your students to explain the phase relationships between voltage and current for each of these two conditions: a circuit with a "leading" power factor, and a circuit with a "lagging" power factor. The terms may make a lot more sense once these relationships are seen. It is very important for students to be able to solve for angles in simple trigonometric equations, using ärcfunctions," so be sure you discuss the method of solution for this question with your students. Explain this analogy, relating the quantities of beer and foam to the different types of power in an AC circuit, and also why this analogy is often employed to describe the "desirability" of each power type in a circuit. The beer itself is "true" power (P, measured in Watts). Good beer, good. Ideally, we'd like to have a full mug of beer (true power). Unfortunately, we also have foam in the mug, representing "reactive" power (Q, measured in Volt-Amps-Reactive), which does nothing but occupy space in the mug. Bad foam, bad. 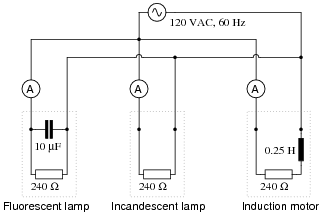 Together, their combined volume constitutes the äpparent" power in the system (S, measured in Volt-Amps). Follow-up question: can you think of any potential safety hazards that low power factor may present in a high-power circuit? We're talking AC power circuits here, not beer! In real life, though, things are not so simple. An electric motor will not come labeled with an ideal-component model expressed in terms of R and L. In fact, that would be impossible, as the resistance R in the circuit model represents the sum total of mechanical work being done by the motor in addition to the energy losses. These variables change depending on how heavily loaded the motor is, meaning that the motor's power factor will also change with mechanical loading. Of course, there do exist special meters to measure true power (wattmeters) and reactive power ("var" meters), as well as power factor directly. Unfortunately, these instruments may not be readily available for our use. What we need is a way to measure power factor using nothing more than standard electrical/electronic test equipment such as multimeters and oscilloscopes. How may we do this? Hint: remember that the angle Q of the S-Q-P "power triangle" is the same as the angle in a circuit's Z-X-R impedance triangle, and also the same as the phase shift angle between total voltage and total current. 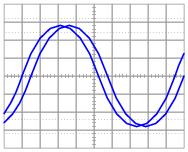 Use an oscilloscope to measure the circuit's Q (phase shift between voltage and current), and then calculate the power factor from that angle. This is a very practical question! There is a lot to discuss here, including what specific devices to use for measuring voltage and current, what safety precautions to take, how to interpret the oscilloscope's display, and so on. Of course, one of the most important aspects of this question to discuss is the concept of empirically determining power factor by measuring a circuit's V/I phase shift. Suppose that a single-phase AC electric motor is performing mechanical work at a rate of 45 horsepower. This equates to 33.57 kW of power, given the equivalence of watts to horsepower (1 HP � 746 W). Follow-up question: what is the ëxtra" current in the 0.65 power factor scenario doing, if not contributing to the motor's mechanical power output? 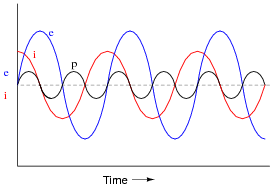 From this figure, calculate the phase angle (Q) and the power factor for this motor circuit. 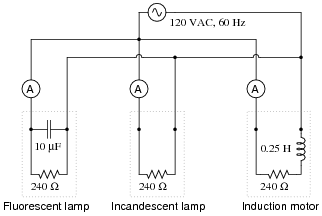 Ask your students to explain the function of the resistor Rshunt shown in the schematic diagram. Discuss whether or not this resistor should have a very low or a very high resistance value. Also discuss the placement of the oscilloscope's ground clip, which is very important in a potentially lethal AC power circuit. A very high-power AC electric motor needs to have its power factor measured. 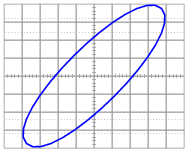 You and an electrician are asked to perform this measurement using an oscilloscope. The electrician understands what must be done to measure voltage and current in this dangerous circuit, and you understand how to interpret the oscilloscope's image to calculate power factor. This question provides a good opportunity to review the functions of PTs and CTs. Remember that PTs are transformers with precise step-down ratios used to measure a proportion of the line or phase voltage, which in many cases is safer than measuring the line or phase voltage directly. CTs are specially-formed transformers which fit around the current-carrying conductor for the purpose of stepping down current (stepping up voltage) so that a low-range ammeter may measure a fraction of the line current. A large electrical load is outfitted with a wattmeter to measure its true power. If the load voltage is 7.2 kV and the load current is 24 amps, calculate the load's apparent power (S). Calculate the power factor and also the phase angle between voltage and current in the circuit if the wattmeter registers 155 kW at those same voltage and current values. Draw a "power triangle" for this circuit, graphically showing the relationships between apparent power, true power, and phase angle. This question provides more practice for students with trigonometry, as well as reinforcing the relationships between S, P, Q, and power factor. Follow-up question: does the addition of the capacitor affect the amount of current through the 5 W load? Why or why not? Ask your students to elaborate on the given answer, explaining why power factor results in excessive line current. Ask them what is meant by the word ëxcessive." Explain what happens to the triangle if power factor correction components are added to a circuit. What side(s) change length on the triangle, and what happens to the angle Q? Ask your students to explain what the "triangle" looks like at a power factor of unity. When a capacitor is to be connected in parallel with an inductive AC load to correct for lagging power factor, it is important to be able to calculate the reactive power of the capacitor (QC). Write at least one equation for calculating the reactive power of a capacitor (in VARs) given the capacitor's reactance (XC) at the line frequency. Then, calculate the size of the capacitor necessary to "correct" the power factor to a value of 1.0, showing the best location of the capacitor in the circuit. 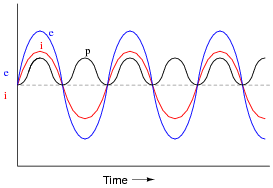 Current through this equivalent series resistance produces heat, and when we're dealing with MVARs worth of reactive power in high-current circuits, this heat can be substantial unless ESR is held low by special capacitor designs. Describe some possible hazards of excessive ESR for a power factor correction capacitor in a high-current circuit. Challenge question: the ideal location for power factor correction capacitors is at the load terminals, where the reduction in current will be "felt" by all components in the system except the load itself. However, in real life, power factor correction capacitors are often located at the power plant (the alternator). Why would anyone choose to locate capacitors there? What benefit would they provide at all, in that location? Still, this does not answer the question of why correction capacitors are not always located at the load terminals. Discuss this with your students and see if you can figure out why (hint: what happens when the load's effective resistance changes, as would happen to an electric motor under varying mechanical loads?). I'll let you determine your own procedure, based on the steps you had to take to correct power factor in other questions! 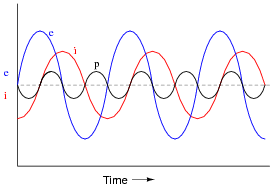 This is essentially a series-resonant circuit, with all the inherent dangers of series resonance (I'll let you review what those dangers are!). If inductive loads have their low power factors corrected by the addition of parallel capacitors, the solution to correcting low power factor for a capacitive load should be easy to identify. I'll let you figure out the answer to this! Explain how the models of "production" and "consumption" relate to reactive power in capacitors and inductors, respectively. Being that neither type of component actually dissipates or generates electrical energy, how can these terms be appropriate in describing their behavior? Part of the answer to this question lies in the fact that most large AC loads are inductive in nature. From a power plant's perspective, the reactive power of a customer (a "consumer" of power) is inductive in nature, and so that form of reactive power would naturally be considered "consumption." Ask your students this question: if customers on an electrical system "consume" reactive power, then who has the job of supplying it? 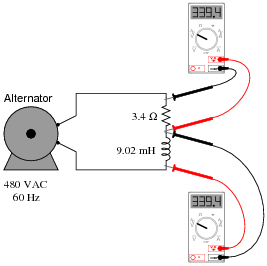 Carrying this question a bit further, are the alternators used to generate power rated in watts or in volt-amps? 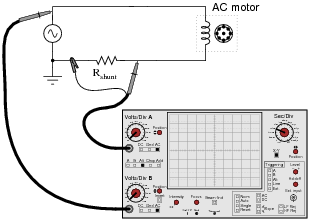 Is it possible for an alternator to supply an infinite amount of purely reactive power, or is there some kind of limit inherent to the device? To phrase the question another way, does the necessity of ßupplying" reactive power to customers limit the amount of true power than a power plant may output? Another name for "capacitor" is condenser. Explain what a synchronous condenser is, and how it is used to correct power factor in AC power systems. 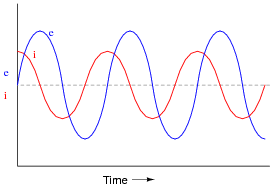 A ßynchronous condenser" is a special type of AC electric motor that happens to have a variable power factor. They are used as variable capacitors to correct for changing power factors. You might wish to mention that most AC generators (alternators) have the ability to run as synchronous motors, and therefore as synchronous condensers. It is commonplace for spare generators at power plants to be ïdled" as electric motors and used to generate leading VARs to reduce heating in the windings of the other generators. This is especially true at hydroelectric dams, where frequent shut-downs and start-ups of generator units is discouraged due to the massive size of the units and the physical wear incurred during that cycling. Capacitors may be selected in combination to provide anywhere from 0 mF to 15 mF, in 1 mF steps.